Bitcoin is a digital currency that functions through the internet and uses peer-to-peer technology to operate with no central authority governing the protocol. The issuing of bitcoin is carried out collectively by the network. It is open-source and free for everyone to be part of. It also has a payment system within its protocol which helps the transfer of value as instant as an email. Through its many unique properties, Bitcoin allows for exciting uses that is not covered by any existing payment system. Going by what seems to be people’s favourite feature of Bitcoin – the dramatic increase in price and it’s future potential to keep increasing, as unlike all other currencies Bitcoin is a deflationary currency. As an asset class, it has been voted as top preference owing to its virtual and decentralised nature. It has been largely compared to gold and even sometimes called “Virtual Gold” or “Gold 2.0” Bitcoin can be used exactly as money anywhere in the globe. Bitcoin gives you the freedom to control your finances. When you start exploring you will begin to believe that with the Bitcoin technology, the possibilities are endless. Can I buy/sell bitcoin without registration and verification? No, you will need to register on Unocoin and verify your email id. You will also need to provide a pan card along with an address proof, and a phone number to complete the verification process. Once verification is complete, you will be able to buy/sell bitcoin through your Unocoin account. I am unable to upload my PAN card and address proof images to the website, what do I do? In the rare event of this happening, please check the size of your attachment. Make sure that the total size of the attachment is less than 10MB and the files are of jpg/png/pdf formats. I don’t have a PAN card, can I still be a registered user on Unocoin? Unfortunately you cannot trade or transact on Unocoin without a PAN card. As all transactions occur between bank accounts, it is a self-regulatory requirement for us to know the sender/ recipient within a transaction. To comply with KYC/ AML regulation and to protect users from illegal activities we are required to collect a copy of your PAN card. It uniquely identifies you as an individual or institution performing a particular transaction. When filling out your profile, please ensure your name should match the one on your PAN card. How do I open an Unocoin Business account? While filling up the form for verification, enter the company name where it asks for “Name :”, then mobile number of contact person of the company who will be operating this unocoin account, pancard number of company. Then when you need to enter the address of company enter the name of contact person as well along with the address. When you submit the documents, please upload PAN card of company, company address proof and contact person’s photo. Certificate of incorporation or registered partnership deed will also be considered as address proof. I have forgotten my password. Please help! On the login page, type in your registered email id and click on the “?” link beside the password text box. Once you confirm that you wish to reset your password. You will receive an email with a link. Click on the link and you should be able to set a new password. How long does it take for deposited bitcoin to appear in my Unocoin Wallet? Once deposited, you will be able to see this in the “Transactions” page usually within a few seconds, but you will not be able to sell/ send these bitcoin until the transaction receives 3 confirmations. Can I have multiple bitcoin deposit addresses? We currently provide one deposit address per verified Unocoin user. We can provide you a new one upon request. How can I send bitcoin as a gift to my friend who does not know about Bitcoin? On the “Send/Receive Bitcoin” page, you will notice an option to either key in a bitcoin address or email id of the recipient, or a bitcoin address from your address book. Type in the recipient’s email id here along with the number of bitcoin you wish to send and hit the “Send” button to confirm the transaction. If the recipient is not a current Unocoin member, they will also receive an email with an introduction to bitcoin and how they can claim your bitcoin gift. You will receive an email notification when the recipient registers on Unocoin and claims the gift. If the recipient fails to claim those bitcoin in 7 days, you will receive a new message that will allow you to reclaim those coins. I have withdrawn bitcoin to another address but the transaction status says “pending”. Please help! Depending on the amount of bitcoin you have requested to withdraw (above 5 BTC), our server may mark it as “pending” till the administror approves it. Also due to huge unplanned withdrawals from our customers, if there are insufficient bitcoin on the server, it will need to be replenished from our secured offline storage. Which means a manual process to send bitcoin to the server will be initiated, this process might takes upto a few hours to complete. How do you determine bitcoin price in INR? And why are Unocoin prices occasionally different to other international exchanges? At Unocoin, the price is calculated based on the bitcoin to USD exchange rate taken from various credible exchanges and its own stock & orders. The main factors that influence its value are: The current USD to INR exchange, market fluctuations and most importantly the demand/supply of bitcoin. Every trading platform offers a buyer’s price and a seller’s price in order to meet (may not be the same across exchanges). In India we have seen this meeting price to be more than the international exchanges as the supply of bitcoin in India is comparatively limited. In a way every exchange is independent of each other and when there is a vast difference in prices between them there will always be speculators looking to make an arbitrage which consequently brings the rates more or less in sync with other exchanges. 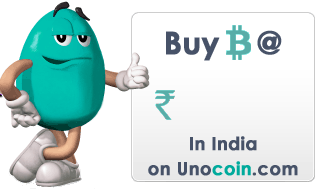 On some trading websites like Unocoin that is specific to a country (India), making a global arbitrage almost impossible. Hence it takes longer for its prices to sync with other international exchanges when there is a sudden spike or drop in bitcoin prices. What is the fee structure for me to buy and sell bitcoin? Kindly refer to our fees page. I have made a deposit of INR using IMPS/NEFT/RTGS. When can I expect it in my INR wallet? Orders are usually processed within 3-4 working hours from the time your payment hits our account but can sometimes take upto 24 working hours. Please note, if your deposit was made on a Saturday evening or on the eve of a bank holiday, then your payment will only reach us the next working day which is when your order gets queued for processing. What happens when a deposit order is processed? Depending on your notification settings, you may receive an SMS and an email when your order is processed. You may now login into Unocoin to buy bitcoin using the INR wallet balance. You need to have balance in your INR wallet to buy bitcoin. On the Buy Bitcoin page, key in the number of bitcoin you are willing to buy and hit the buy bitcoin button to complete your purchase. We honor your buy orders that are placed 24×7 irrespective of working hours. What are my buy/sell limits? What are my options if I need to buy/sell above the set threshold? As a verified user, you will be able to buy 20 bitcoin and sell 20 bitcoin per day. After an extended period (minimum 60 days) of buying and selling and a significant trade volume (of atleast 100 BTC of buy+sell), you will be offered the “Gold Member” account where you will be able to enjoy higher buying and selling limits along with lower transaction fees. After selling bitcoin, how long does it take to receive my payment? We need upto 1 working days to process your order and we do the payments in batches. Once processed, most payments are made via NEFT/RTGS which is usually credited on the same working day but can take a maximum of one working day. In the rare event of having to pay you by cheque, it may take upto 5 working days. You will be kept informed if this is the case. We honor your sale orders that are placed 24×7 irrespective of working hours. I have given incorrect bank/ bitcoin details on my order, how can this be fixed? Please email us immediately to support@unocoin.com followed by a call on our customer care number with whatever amends that need to be applied to your order. Provided the order has not yet been processed, we may be able to stop the transaction and advise you of the next steps. Can I make INR deposit from different bank account? No, the deposit should be made from your registered bank account ONLY through IMPS / RTGS / NEFT. DO NOT deposit from third party wallets or third party agents. The Two factor authentication enables us to verify you as a user trying to login by providing a password along with a 6 digit code generated on your mobile or received through SMS on your registered mobile number. Please note this code keeps changing every 30 seconds. Therefore, even if your password is compromised a login is still unsuccessful as long as you alone have access to this 6 digit code. I had the two factor authentication enabled on my Unocoin account but I have lost/had to format my mobile phone. Please help! Please send an email to support@unocoin.com from your registered email id. After we complete your phone verification, we can reset your two factor authenticator option. You will then be able to login using the SMS based OTP and setup 2-factor-authentication again. What are the different notifications options that i can set on my account? Under Account Settings > Settings> Email Notifications, you can enable notifications whenever there is a deposit or withdrawal of INR or whenever there is a deposit, withdrawal, purchase or sale of bitcoin. We are looking to add more notification options in the near future. Unocoin charges a fee of 1% to buy or sell bitcoins. Over an extended period of usage (minimum 60 days) and a significant transaction volume on your account, there will be an upgrade to “Gold Membership”. With this upgrade the transaction fee drops to 0.7% and giving you a higher transaction limit per day. A government levied IGST of 18.0% will be charged on the transaction fee. For example, if you are buying bitcoin for 10,000 INR, then the transaction fee at 1% will be 100 INR and the IGST on that transaction fee would be 18 INR. Hence you will end up paying 10118 INR in total. Net banking and PayU Money mode of payment to instantly buy bitcoin will incur an additional 1.9% transaction fee. Our IGST number is 29AABCU8112D1ZI. When you buy bitcoins and opt to receive on an external bitcoin address as opposed to your Unocoin wallet, the network fee is incurred by Unocoin which means there will not be any deduction in bitcoins paid to you. When you send bitcoins to an email-id of Unocoin user, there is no fee. When sending bitcoins to a bitcoin address, Unocoin collects 0.0005 btc (from 17th March 2017 and this might increase if there is network congestion) that is deducted from your Unocoin balance which is paid to the network that is processing your transactions. There is no fee for receiving bitcoins on your Unocoin wallet. There is no fee to store your bitcoins on Unocoin wallet. P.S: The above fee are subject to changes without notice. You can visit this page using the link at the bottom of every web page for updates on the fee structure before completing a transaction.